The TUFF range of personal air sampling pumps offer the user an extremely robust, rubber over-moulded unit designed specifically for use in harsh monitoring environments. With the range offering a wide flow rate from 5 ml/ min* to 4.5 l/min. TUFF pumps are ideally suited to a wide range of occupational health sampling applications from simple abatement sampling of lead and asbestos, to more specialised industrial hygiene monitoring of dusts, fumes and vapours. The units offer excellent functionality at a competitive price. TUFF has been ergonomically designed for user comfort with easy to read display and high intensity alarm LED's for fault indication. The TUFF range meet EN1232 and NIOSH 0600 requirements for personalised sampling pumps in workplace environments. The TUFF pumps convenient charging cradle allows single or multiple pumps and separate battery packs to be charged. Intelligent battery monitoring and fast / trickle charge control maintains optimum battery condition and service life. Full charge can be obtained in typically less than 5 hours on fast charge. Embedded battery pack intelligence tracks state of charge, and long term battery condition. Entry level pumps for abatement and general sampling applications. With simple single point flow setting, elapsed run time counter and run mode only. Simple battery life indication. Drop in fast charger. Offer additional functionality including: Display of flow set point, real time flow rate, accumulated sample time and volume. Programmable Run Duration mode. Upgradeable to Pro. I.S. models are used where hazardous atmospheres can be present from flammable gases or dusts. In this situation, IS models should be used. Additional models are available which satisfy the stringent requirements of mining applications that are rated to 'M1', the only pump in the world to have this level of certification. Offers advanced program functionality and download capabilities suited to the most demanding occupational and industrial hygiene applications. 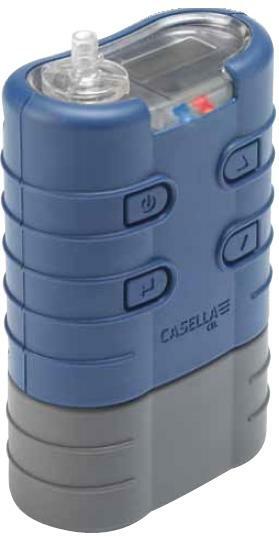 Offers all functionality of the Plus model with the addition of:- Intelligent Hours Remaining Battery 'Fuel Gauge', Time Weighted Average (TWA) sampling mode, 2 user defined timer programmes (9 on / off times) and onboard data logging for up to 100 runs with download capability to Casella Insight Data Management Software (see separate data sheet). The units operate from removable 4.8V Nickel Metal Hydride (NiMH) rechargeable cells. 1.7Ah standard pack for general short term monitoring applications or the high capacity 2.7Ah versions where longer sampling durations may be required.